Our complete line of bulk foodservice Vegetable soups are used in thousands of restaurant dishes by chefs around the world. Trust the restaurant supply superstore for all of your Vegetable soup and bases. Vegetables have been proven to reduce heart disease and cancer and should be included in every meal. Campbell's Old Fashion Red and White Vegetable Soup 10.5 Oz. Campbell's Garden Vegetable Condensed Soup 50 Oz. Campbell's Ready To Serve Easy Open Vegetable Soup 7.25 Oz. Campbell's Ready To Serve Easy Open Vegetable Beef Soup 7.25 Oz. 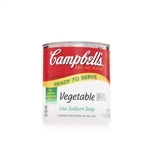 Campbell's Ready To Serve Low Sodium Vegetable Soup 7.25 Oz. Campbell's Vegetable Beef Soup 10.5 Oz. 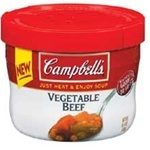 Campbell's Vegetable Beef Condensed Soup 50 Oz. Campbell's Vegetable Condensed Soup 50 Oz. Campbell's Vegetarian Vegetable Condensed Soup 50 Oz. Campbell's Red and White Vegetable Soup 10.5 Oz. Heinz Vegetable With Beef Stock Soup - 51.5 Oz. Heinz Vegetarian Vegetable Soup - 51.25 Oz. Knorr Liquid Concentrate Base Vegetable - 32 Oz. Soup Du Jour Vegetable Beef Barley - 13.9 Oz. Du Jour Garden Vegetable Soup - 8.7 Oz. Knorr Vegetable Soup Mix - 19.01 oz. Pacific Organic Vegetable Broth - 32 Fl. Oz. Amys Organic Vegetable Barley Soup - 14.1 Oz. Amys Organic Lentil Vegetable Soup - 14.5 Oz. Amys Organic Black Bean Vegetable Soup - 14.5 Oz. Amys Organic Chunky Vegetable Soup - 14.3 Oz. Amys Organic Fire Roasted Southwestern Vegetable Soup - 14.3 Oz. 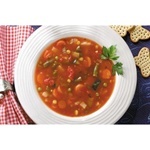 Organic Lentil Vegetable Soup - 14.5 oz. Red and White Vegetable Beef Bowl Soup - 15.4 oz. Bulk Vegetable Soups are used in many different restaurant dishes and is served ala cart in salad and soup bars.